SunFest 2016 offered an unpredictable mix of something old (Duran Duran on the Ford main stage) and something new (Meghan Trainor on the Tire Kingdom stage at the Meyer Ampitheater) with its April 27 opening night’s national acts, and continued the trend throughout its five days. Gifted area singer/songwriter Mike Mineo rocked the main stage before Train eventually closed it on April 28, and Death Cab for Cutie provided most of the fire on the Tire Kingdom stage leading into the weekend on April 29. Saturday, April 30, offered a main stage double-shot of international hip-hop via Salt N Pepa and the incomparable Roots; singer/guitarists from Hollywood status (Rick Springfield) to part-time local (Bobby Lee Rodgers) offered contrast on the Tire Kingdom stage before former Allman Brothers Band drummer Butch Trucks wowed the crowd with his new Freight Train Band, and Goldfinger and Fitz & the Tantrums highlighted the newly opened jetBlue south stage. On SunFest’s final day, banner sets on the Tire Kingdom (Evanescence) and jetBlue (Walk the Moon) stages stood out, all leading up to the main stage closer, newly decorated Grammy-winning blues-funk outfit the Alabama Shakes. And the quartet from Athens, Ala., along with two touring keyboardists and three backing vocalists, put on a clinic in gospel-tinged soul. A capacity crowd was transfixed from the opening “Future People,” a lilting track from the group’s Grammy-winning (for Best Alternative Music Album) 2015 release Sound & Color. 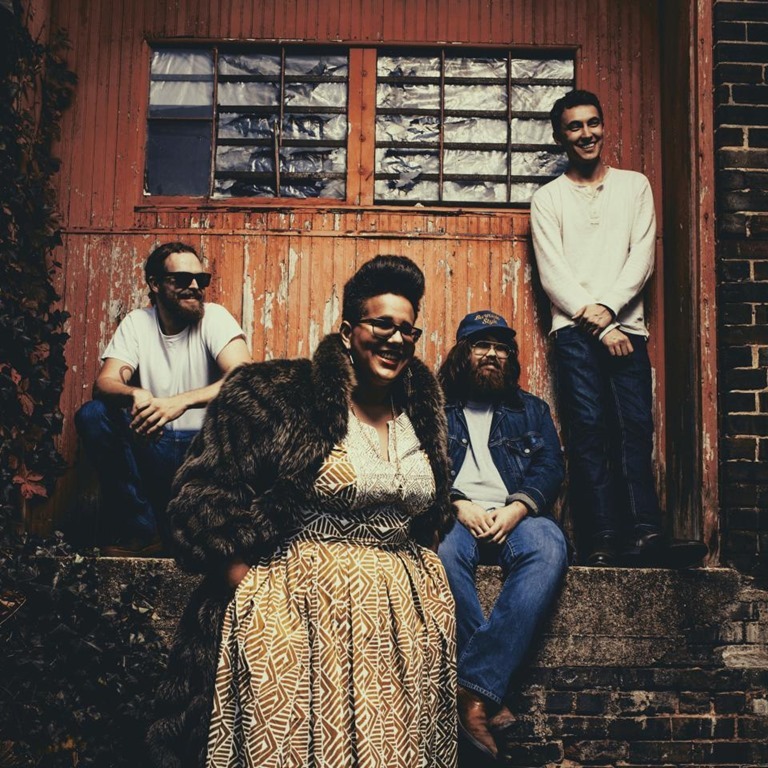 Vocalist/guitarist Brittany Howard’s eerie, high-pitched vocals during the verses set the tone to expect the unexpected — even on material that was largely retro. Larger than life in both voice and stage presence, it’s hard to imagine her knowing how. Along with guitarist Heath Fogg, bassist Zac Cockrell, drummer Steve Johnson, and keyboardists Ben Tanner and Paul Horton, Howard delivered several middle highlights from the group’s 2012 debut CD, Boys & Girls. Howard introduced backing vocalists Lloyd, Karina and Shermaine after they’d helped her torch the rocking “Hang Loose;” the blistering double-time gospel rave-up “I Ain’t the Same” brought the crowd to a frenzy, and the strutting funk of “Hold On” featured startling accents by the workhorse rhythm section of Cockrell and Johnson and an exaggerated, dramatic ending. Yet sometimes Howard put down her guitar, allowing her to further work and convert her congregation. With a voice that mixes Mavis Staples and Etta James with Janis Joplin and the Black Crowes’ Chris Robinson, she serenaded the audience on the swaying Sound & Color title track amid the textural brilliance of Tanner and Horton, each seated at keyboards on opposite ends of the stage. The 90-minute set concluded with the gospel intro and subsequent double-time cadence of the same recording’s “Over My Head.” Like the Alabama Shakes themselves, the piece mixed elements of the Memphis, Tenn.-based Stax Records, the Detroit-based Motown label, and of course, the classic material that came out of the Muscle Shoals Sound Studio in Alabama starting in the late 1960s. There would be no encore, seemingly as if SunFest wanted to direct everyone’s attention to the closing fireworks instead. Still, the simulated bombs bursting in air paled in comparison to the arsenal just delivered by the Deep South’s latest soulful sensation.